Stop one, At Camp Sa’ad we met 1st Lt. Sion Brannan a former teacher from San Diego that taught math in San Jose, California. Brannan worked for four years in a high school teaching math and when OIF started he figured he should do something about. After the school year he notified his principal, enlisted in the Army and completed all the necessary training to enter the Army as an Officer and a Ranger. It is people like him that are the true Patriots. 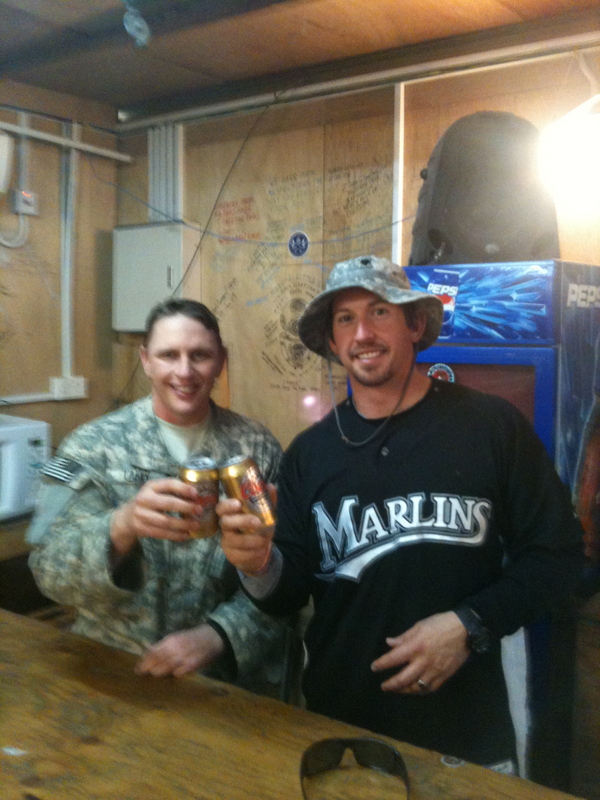 I also met specialist Lyon (strongest guy in base) and I traded him my Marlins Strength and Conditioning shirt for his army boony with his specialist patch illegally sewn on. The guy was a serious monster and seemed to have spent few hours in their tent weight room. We met the division general that worked on base and had tea with him which was weird. From what we were we told you usually don’t make it out of an Iraqi General’s office if you are not in the ally Military. On a sad note, I met an infantrymen that lost his baseball career to an IED in Iraq during the first part of OIF. He told us that we were living his dream. This trip has been very rewarding, but it is really tough to hear stuff like that. We jumped back into our Black Hawk and headed to the southern most point of Iraq, the Naval Base of Umm Qasr. This was definitely the most diverse base we had been to as far as the international make-up of the population. We met soldiers from the Royal Navy and Royal Marine Corps as well as IA and Americans. While we were delayed waiting for our helicopters, I got in a workout at their out door gym. I got to test my rope climbing skills and scaled the 25 feet pretty quickly. Luckily, they taught me how to safely descend. We met a Captain from Minnesota, and even a Navy Admiral! We learned about the different Naval Ranks and how they compared to the other branches of the military. From what I was told, the Navy is structured like Star Trek. I also shared my first “near-beer” and was forever linked with the men of Umm Qasr. We took a tour of the base and saw an old Iraqi spy boat, as well as the border of Iraq and Kuwait. Instead of taking our normal transport (two Black Hawk Helos) we had to convoy it to Bucca, our next stop. I will say that the ground convoy was definitely the scariest part of this trip. It is one thing to hover over the ground with machine gun armed guards and watch the desert zoom by below, and another to actually drive out into the desert in a slow moving MRAP (Mine Resistant Ambush Protected) Truck. The MRAP has a diamond shape to it that deflects the force of any mine blast from below. instead of having a flat bottom that absorbs all of the explosion, the shape causes the vehicle to roll instead of blow up. We are sealed in with automatic doors, so if we were blown up from below and ambushed from the side, all parties enclosed in the vehicle would be okay. Having to get into that big “truck” for thirty minutes of tense, bumpy travel was scary. Thankfully, we arrived safely at forward operating base Bucca!